Our Four Prong 2.75mm Round Cubic Zirconia Eternity Band features .10 carat each brilliant 58 facet stones that are hand cut and hand polished. 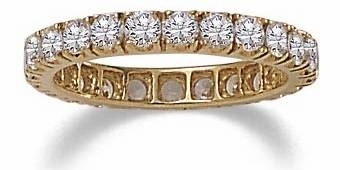 This prong set cubic zirconia eternity band includes an approximate carat weight of 1.75 carats of high quality Russian formula simulated man made cubic zirconia. This eternity band makes for a great wedding band to be worn with an engagement ring or can be worn on its own as an elegant eternity band. Many customers purchase two bands or more to wear as stackable rings or to wear one band on each side of a solitaire engagement ring. Eternity bands are also known as Infinity Bands, Eternal Bands and Love Bands. Available in whole finger sizes with your choice of 14k white or 14k yellow gold.